The L.M. Montgomery Conference is now underway and the Social Media Team will be bringing you a summary of events every day. Today's is by Michaela Wipond. Earlier today, Michaela spoke on "The Montgomery Myth: Prince Edward Islanders Reading L.M. Montgomery." Remember to follow @LMMI_PEI or the hashtag #LMMI2018 for the latest conference news. 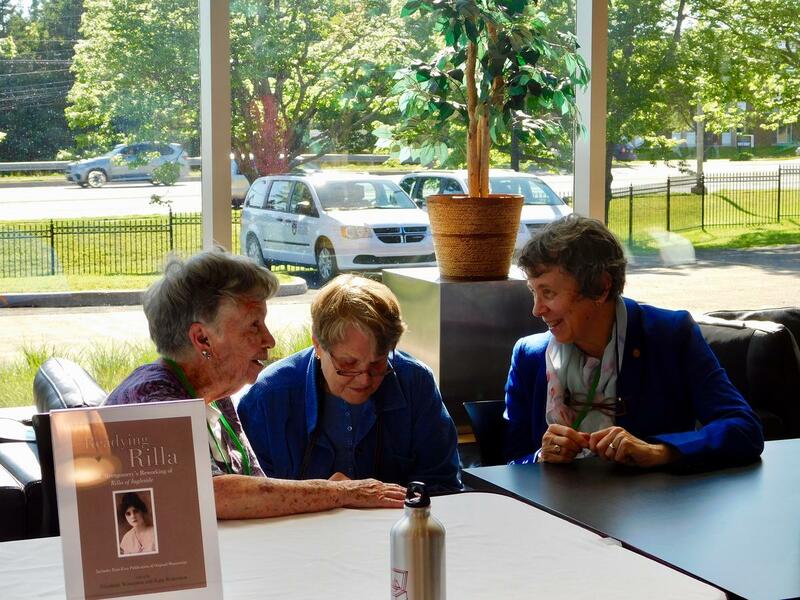 The second day of the L. M. Montgomery Institute's 13th Biennial Conference, L. M. Montgomery and Reading, began with a difficult choice between two concurrent sessions: "New Reading of Old Texts" and "Translation and Reading." For more detailed descriptions of the panels and presenters, see the conference schedule here. After a half-hour break, Margaret Mackey from the University of Alberta delivered her keynote address on "L.M. Montgomery and the Shadow Life of an In-Dwelling Reader." We were joined for lunch by Rebecca Parent and Josh Wiles, stars of Anne & Gilbert: The Musical. Parent is returning to a role she first performed in 2007. Two more guests from the musical will be with us for lunch tomorrow. 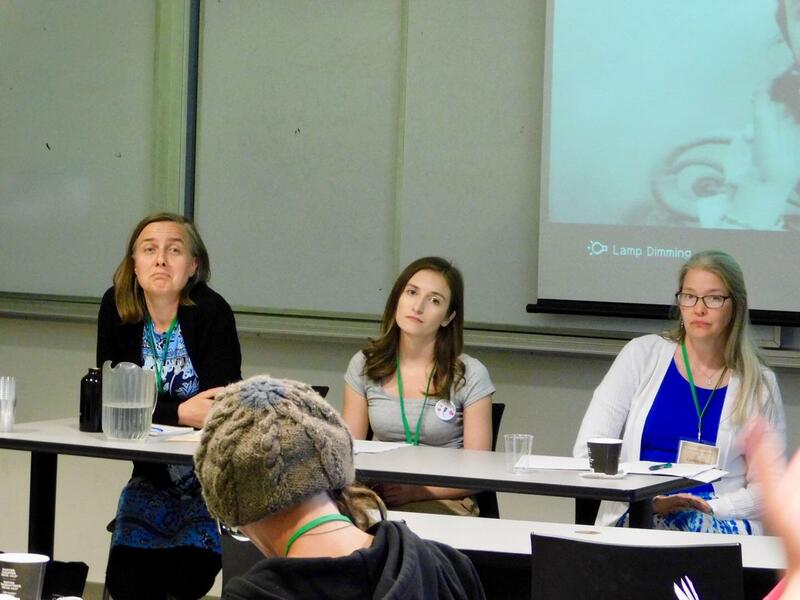 After lunch there was a plenary panel on "Reading Montgomery in Canada," chaired by Emily Woster and featuring Kate Scarth, Audrey Loiselle, and yours truly. There was a mad dash to the hallway after the plenary because the silent auction was closing and everyone wanted to get their last-minute bids in. More than two hundred items had been donated, the proceeds from which went directly to the Friends of the LMMI. I believe the highest-grossing item was a homemade apple blossom quilt, which sold for $300! For the afternoon, conference attendees had a choice between three concurrent sessions: "Reading Montgomery in Japan," "Reading the Writer," and "Reading Death, Loss, Absences." Choosing which sessions to attend has proven an almost impossible task--everything sounds so interesting! To conclude our day at the university, we had a "New Book Celebration." Laura Robinson read aloud descriptions of new Montgomery-related books which were then sold by Bookmark PEI and signed by authors in attendance. It's truly astounding how much Montgomery literature has been published in just the past two years. Tonight the Institute is hosting "Performing Montgomery" with Rosalee Peppard and Deirdre Kessler at the Holland College Florence Simmons Performance Hall. Anyone who heard Peppard play for the Lucy Maud Montgomery Society of Ontario in October knows just how special her gift is.